My friend's daughter was turning 13 and having a fancy masquerade party with all of her girlfriends this weekend. They all got dolled up in dresses and masks with feathers and sequins. The birthday girl picked out this gorgeous mask as the theme of her cake. I will admit that I was a little intimidated by the color scheme of black and gold, especially since they didn't originally request fondant. When I said that I wasn't sure that I could accomplish the design they wanted in the colors they wanted with buttercream, my friend wanted to be sure she wouldn't be missing out on my icing. Once I assured her that there would be plenty of buttercream icing under the fondant (and agreed to bring her a bowl of icing), she said that I could use fondant. Of course (just keepin' it real...), it wasn't all smooth sailing, especially since this was the weekend that I took on TWO cake projects, and procrastinated on both of them all week because I wasn't feeling well and had no energy. I finished the bridal shower cake late Friday night, and began making the fondant for this one on Saturday morning. For some still-unknown reason, the powdered sugar would NOT incorporate into the melted marshmallows, and my KitchenAid stand mixer was proving to be inadequately small for the job. So, I ended up running to Michael's and using a 50% off coupon to buy fondant as a last resort. Ugh. The cake was white chocolate with buttercream filling, and I covered the cake in white fondant, sprayed it with edible gold paint, and added black fondant stripes and border. 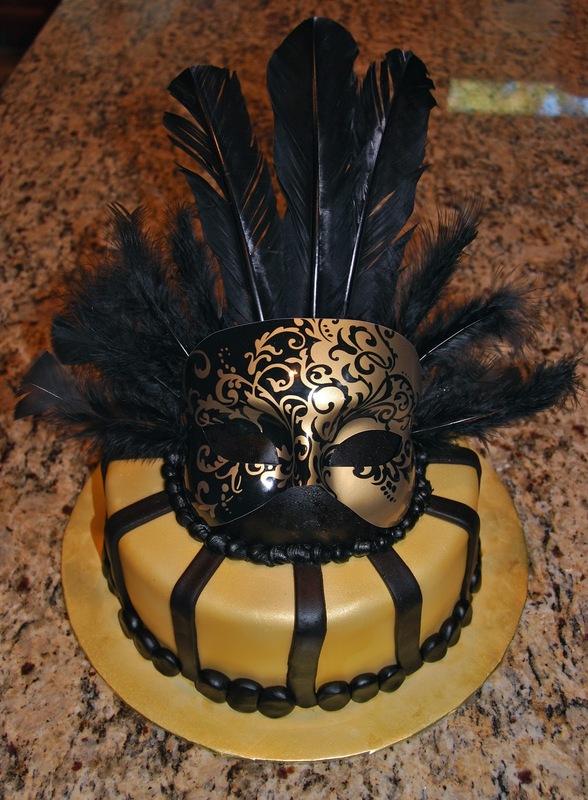 There is a dome-shaped cake underneath the mask, which is covered in black fondant. I added the feathers for a little extra flair. I wanted to be a little fancier, but was running short on time, so I had to call this the finished product this time. The good news is that the cake was a big hit and the birthday girl loved it! That makes me happy. This looks very unique! Love it!